WekaIO Matrix Software solves the challenge of scaling high performance file workloads from tens to thousands of server clients. Matrix Software transforms a cluster of compute servers (on-premises or in AWS) into a globally shared, POSIX compliant file system that delivers industry leading performance and scale for enterprise file workloads and HPC environments. Matrix Software makes it simple to install and manage hundreds of compute nodes from a single management console. 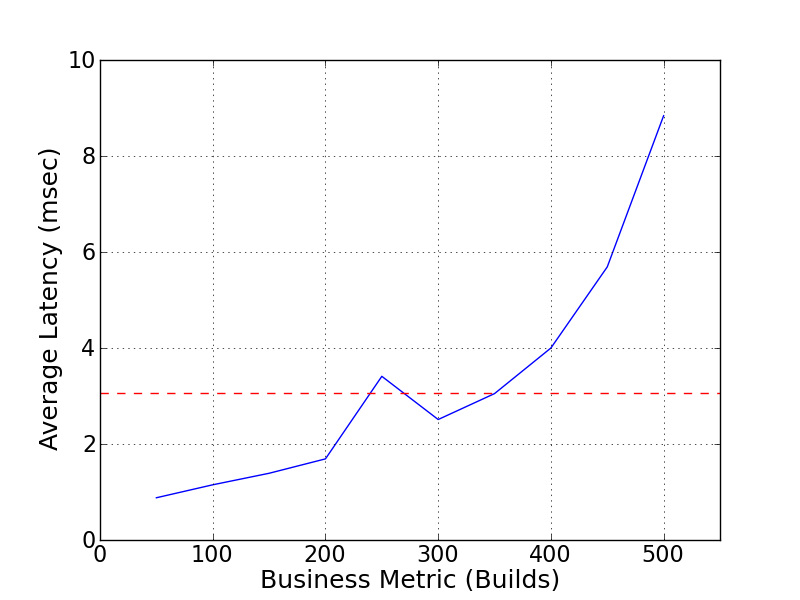 For peak performance needs, additional Matrix instances can be dynamically added to scale performance, while capacity can be scaled independently within the compute nodes. WekaIO Matrix is flash native providing the highest performance to applications, and its integrated tiering mechanism automatically moves cold data to any S3 or Swift compliant object store (on-premises or public cloud), while maintaining data locality to the applications. All data is presented as a single global namespace. WekaIO Matrix is ideal for technical computing workloads such as EDA design, Big Data analytics, software development, genomic sequencing, financial analytics, media rendering and HPC research. The software can be deployed natively in a hyperconverged mode with zero additional footprint, or as a dedicated storage appliance. Because it is a software only solution it is up to 80% less costly than external flash based NAS appliances. 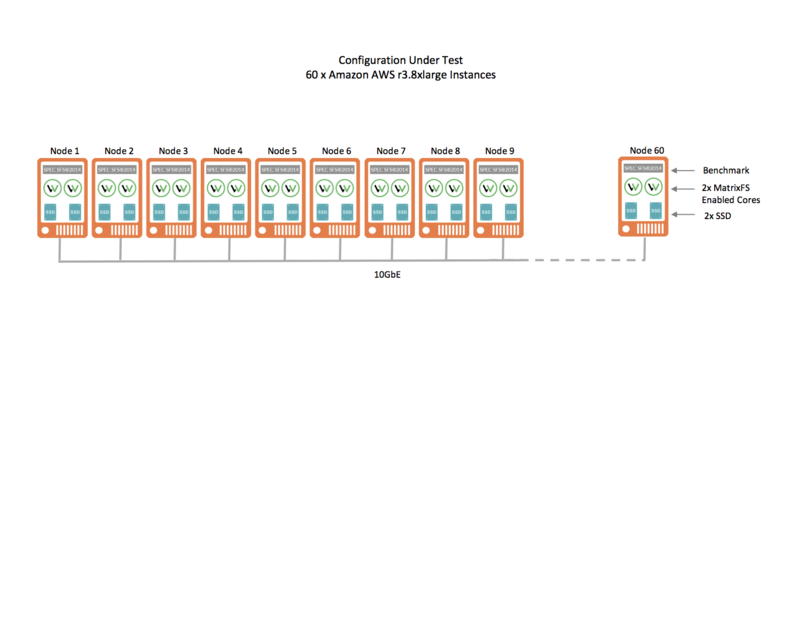 This test platform is a hyperconverged implementation. 1 Hyperconverged Server Nodes MatrixFS File System 2.5.2 WekaIO Matrix is a distributed and parallel POSIX file system that runs on any SSD enabled commodity server or cloud compute instance and forms a single cluster. The file system presents a single high performance, scalable global namespace to the applications running in the cluster. 2 Hyperconverged Server Nodes Operating System CENTOS 6.7 The operating system on the hyperconverged server was 64-bit CENTOS Version 6.7. SR-IOV was enabled in the EC2 instance BIOS. No additional hardware tuning was required. The MTU is required and valid for all environments and workloads. A single WekaIO Matrix file system was created and distributed evenly across all 60 instances in the Amazon cluster. Data was protected to an 15+2 failure level. All data and metadata is distributed evenly across the cluster. WekaIO MatrixFS was created and distributed evenly across all 60 instances in the Amazon cluster. The deployment model is as a hyperconverged architecture where both storage and application services are run on the same infrastructure. Each EC2 instance has 32 vCPU, 244GiB of memory and 2x320GB (total 640GB) of SSD local to the instance. Two cores of the available 32 (6.25%) were provisioned with MatrixFS, the remaining 30 cores were available for application usage. Each instance had 13GB (5%) of memory assigned to WekaIO. WekaIO Matrix utilizes the shared 10GbE Virtual NIC on each r3.8xlarge instance. 1x10GbE Virtual NIC per EC2 instance for a total of 60. Applications and storage run on the same network. Each amazon instance had 32 vCPUs. WekaIO used only 2 cores per instance. Each WekaIO instance used the EC2 instance ephemeral drive for stable storage. Data was protected using WekaIO Matrix Distributed Data Protection (15+2). The data is journaled as well as UPS protected accross multiple layers. The solution under test was a standard WekaIO Matrix enabled cluster in hyperconverged mode. The solution will handle both large file I/O as well as small file random I/O and metadata intensive applications. No specialized tuning is required for different or mixed use workloads. The storage services and client applications share the same instances without the need for any additional dedicated storage instances. The EC2 instances are both the load generators and the storage nodes. All of the instances accessed the same WekaIO Matrix shared file system that was distributed and protected across all of the EC2 instances.